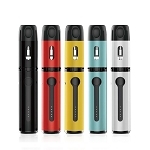 The Suorin Drop is a new and improved liquid pod vaporizer from Suorin that sports an ultra thin and curved "Drop" shaped body that fits much better in the hand. 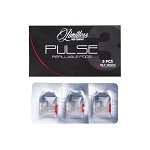 This cutting-edge low output liquid vaporizer is primarily intended for use with high nicotine/salt e-liquids. This type of vaporizer requires very little power, it is equipped with a high grade 310mAh lithium-ion battery that provides a 13W output. The low output will keep the Drop pumping out fresh clouds for days at a time without needing a recharge. When you do eventually need to recharge you can connect to the included micro-usb cable and you will have a full battery in just 40 minutes. To lengthen the battery's lifespan it is recommended you allow the Drop to fully charge before it's first charge. 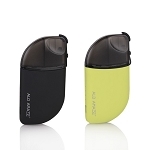 Each Drop Vaporizer Kit includes refillable liquid tank cartridge. This liquid pod sports an easy fill design that allows you to achieve the maximum 2ml capacity in moments with no mess and it utilizes a classic kanthal/cotton atomizer to heat your liquids. Suorin's Drop measures in at just under 3 inches tall by about 2 inches wide and weighs just 62 grams, easily making it one of the smallest of this type. You can throw it in a pants/jacket pocket and go on about your day without it weighing you down everywhere you go. Very fast shipping. Item came brand new and sealed. It came with with everything that's supposed to be in the starter kit. I've had it for a few days now and no problems yet.